Wag'N strives to educate and promote the principles of PET EMERGENCY MANAGEMENT by providing solutions to First Responders, Pet Parents and Service Industries, to effectively mitigate, prepare, respond to and recover from emergencies that impact pet health and safety. You will be hard-pressed to find a more energetic and knowledgeable safety and preparedness expert and advocate than our Founder, Ines de Pablo. Ines holds both a Bachelors Degree in Criminal Justice as well as Masters Degree in Risk, Crisis & Emergency Management from the prestigious George Washington University in Washington D.C. and has since then acquired extensive field training experiences and achievements. Her extensive background in the field of emergency management, law enforcement training, EMS, risk mitigation, continuity of operations for businesses and pet safety made her a leader in the pet safety industry. Prior to starting Wag'N Enterprises, LLC and Wag'N O2 Fur Life, LLC., Ines acquired a substantial background in the safety & security industry. Her safety oriented career started in 1999 while working at a Washington DC-based emergency management company. It was there where Ines learned tactical skills, and provided marksmanship and defensive driving training to law enforcement and government agencies. Those skills led to the creation of The Emergency Management Network. With refined skills in her grasp, Ines was deeply moved by the aftermath of Hurricane Katrina and the lack of preparedness which resulted in the unnecessary death and abandonment of roughly 600,000 pets. It was this shocking and unfortunate event that propelled Ines to apply her expertise to educate pet parents, respond to the need for pet preparedness protocols and the need for effective tools to assist in pet emergency mitigation. It marked the beginning of WagʼN Enterprises, LLC — the first and only dedicated Pet Emergency Management Company in the World. Ines has participated in many national interviews and educational forums and is actively involved in the metropolitan Washington D.C. area for education and safety event. Ines is a former licensed Emergency Medical Technician for Basic Life Support (EMT - BLS) In Washington DC. 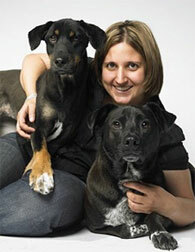 In addition she is a former licensed PetTech® Master Instructor and serves her community by leading workshops and seminar on pet life saving procedures. Humane Society's "Dog Bite Prevention for Law Enforcement & Other First Responders"
Humane Society's "Interpreting Animal Behavior for Safe Handling"